We have noted that many townhouse owners are dumping household trash and furniture in the THOA common areas. Please ensure that you contact American Disposal to dispose of your trash. The association has to incur the cost of removing this trash and it becomes very costly for the association. Should you have questions please feel free to contact the office. The Sugarland Run HOA assessment is $71.15 for single family homes and $35.56 for Hunington Ridge. The Sugarland Run THOA assessment is $62.20. Please note that office will be closed in observance Christmas on December 25, 2018 and New Year’s Day on January 1, 2019. The Community Activities Committee continues to bring the community together with “FUN IN SUGARLAND RUN”. Have ideas for new events or recommendations to improve events you have attended in the past? Join us at our monthly meetings or email us at SRHOACAC@gmail.com with any questions or suggestions! In an effort to improve and enhance communication with residents the SRHOA board is launching a email subscription list. To start we will be emailing out the monthly newsletter to those subscribed, we will still be mailing out hard copies as well. 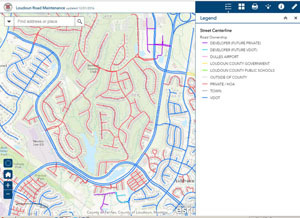 Loudoun County has launched a new online tool to help residents determine the entity that is responsible for maintaining roads within the county, including snow removal and surface repairs. The interactive, searchable map provides users with a resource for navigating the complex maintenance responsibility system for the road network in the county. In addition, the map links to a webpage with contact information for the various entities to help residents report concerns about maintenance to the correct entity. Users may search by a street address, view responsibility by color-coded system or click on a particular road and a pop-up box will appear indicating road maintenance responsibility. The responsibility for road maintenance in Loudoun County varies by road. Most roads are maintained by the Virginia Department of Transportation (VDOT), one of the county’s incorporated towns, and private entities, such as homeowners associations (HOA). As newly-constructed roads are developed, maintenance responsibility may change from one entity to another, such as from a developer to a homeowners association. The Loudoun County map will be updated on a monthly basis. A link to the map and contact information for the various entities involved in road maintenance in the county may be found on the Loudoun County website at www.loudoun.gov/roads.